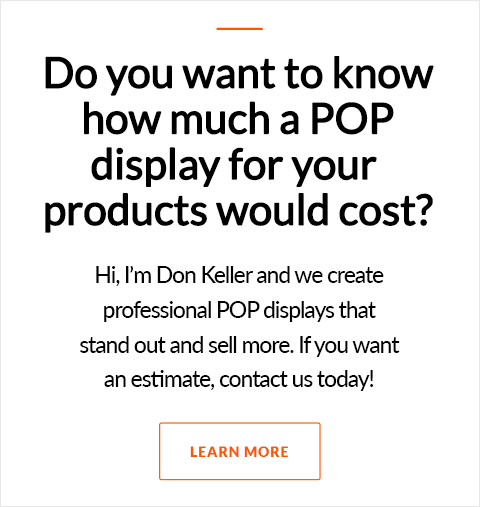 How Much Do Point of Purchase (POP) Displays Cost? Let’s discuss some options to see if they fit your needs. First of all - let’s talk usage. How long will this display need to last? Is it temporary? And only intended to be up for weeks or months? 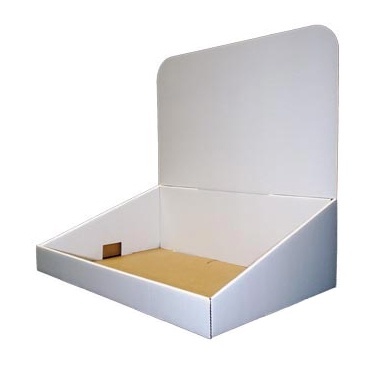 Most of these types of displays are made from corrugate or sturdy coated paper stock. Corrugate can be used for free standing floor displays, shelf and counter displays, end caps, sidewings, PDQs, quarter pallet and the list goes on! These are the most common types of displays. I’m sure you’ve seen them in your favorite grocery store. 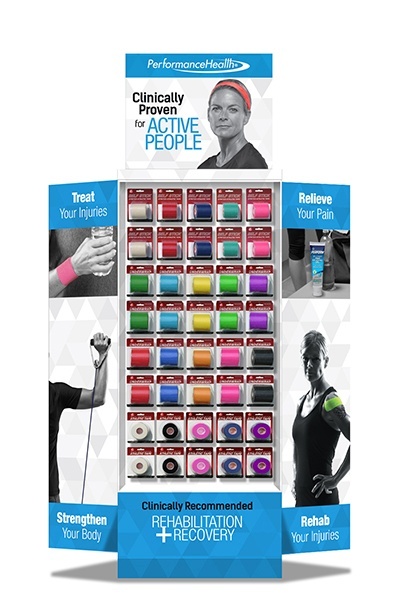 Either on the shelf or free standing in the aisle displaying just about every type of product. 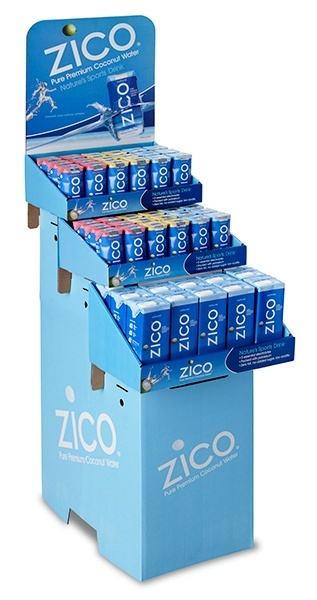 These are also used quite extensive ly in big box stores, again either at the end of the aisle as an end cap display or in the aisle itself either as a bin type of display or pallet display. Corrugate is VERY versatile and can be constructed to hold quite a bit of weight such as multiple cases of beverage. Corrugate POP displays are also the least expensive point of purchase displays. With new digital printing technologies, large sheets of corrugate can be printed and cut with out the need for printing plates and mechanical die cut plates. That eliminates the start up costs that used to be associated with corrugate printing. AND since these are digitally printed, full color can be used, adding the graphic excitement that is needed to catch your customer’s attention. The biggest PLUS with digitally printing corrugate is that they can be done in small quantities rather economically. 5 - 10 and even a couple hundred are possible and untouchable in cost by any other printing methods. The biggest advantage of digitally printing corrugate POP displays is how fast they can be produced. Once the die line and artwork is approved, displays can be printed in as few as 7 business days! As I mentioned earlier, cost associated with corrugate displays is determined by size. A larger display such as a free standing floor display usually consists of 3 pieces, a base, a series of shelves or trays and a header. 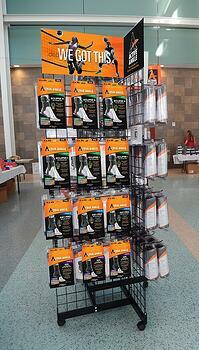 Usually a floor display stands about 48” to 60” tall and anywhere from 14” up to 20” wide. So you can imagine how much corrugate that would take to create a display that size. Pricing is based on the square foot it takes to produce your display and pass through the press. For instance, a counter display will cost less than a floor display. Small displays can also be grouped so that multiple displays can fit on one sheet thus reducing costs. Are stock displays available you ask? Yes, stock displays do exist and can keep your costs down but there is a trade off. For the most part, stock displays are usually ALL white corrugate and are NOT printed. Headers, although, can be digitally printed for an upcharge. The biggest drawback to using stock displays (besides not having a colorful, eye-catching display) are that they are only available in pre-made sizes. So, if your product ‘FITS’ the display then you are golden, but if not, you’ll have to make do or go to custom displays. Getting a price on a custom sized point of purchase display is not hard, BUT (there’s always a ‘but' isn’t there?) You’ll need a die line to do that. Well a die line is the line drawing of measurements or a TEMPLATE of a POP display. It shows all the dimensions, folds, and cuts of the display in a flattened form. 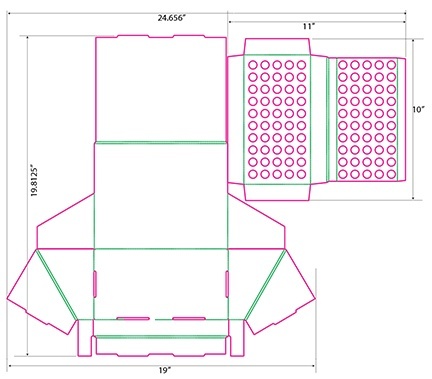 Creating a proper die line is essential to estimating a display. Usually a display can be estimated based on previous displays, but when your display is designed to fit your product, there could be a difference in cost. Sizing of your display is important as well. You’ll also need to know what the store specifications are. Many big box stores have them and don’t allow displays that don’t fit their specs. Just contact your store buyer or store merchandising department before creating a die line. These displays, as the name applies, are meant to last for quite some time in the store. For a year or longer! As you can imagine, for a display to last that long, it will need to be created out of materials that can take that kind of use. Usually they are made from plastics, acrylics and even metals. With these type of displays and the printing processes needed for each, the cost will rise dramatically. Because of the increased cost, these displays are used for either multiple products or products with a higher ticket price. These displays also require more planning which will have longer lead times for production. Permanent displays are meant to last up to 3 years and are built well and usually have a prominent position within the store. Up to 82% of purchase descions are made in store. Most shoppers go to the store with a need for products but their decisions can be persuaded in store by effective POP displays. Producing POP is a powerful way to increase your sales in store. Did you know that 62% of shoppers buy an item on impulse AND 16% of those purchases are persuaded by displays? Adding Point of Purchase displays to your marketing efforts may be just what you needed to spike sales. 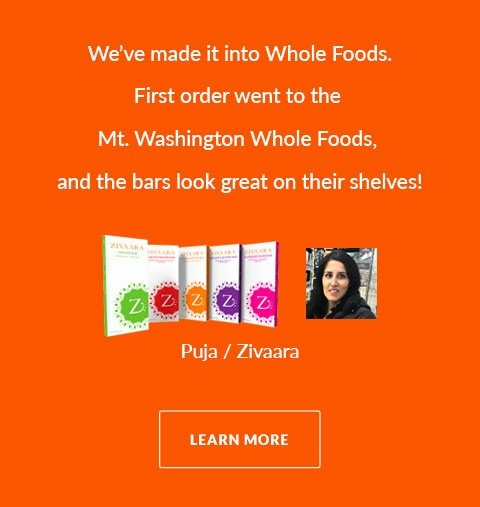 Get your products off the shelf and in front of your customer. Show them why your product is better and they are likely to add your product to their cart! If you need help with a point of purchase display project, contact us. We'd be happy to help.